Optimus Prime arrived at the meeting point, surprised to see more than the expected Vector Prime present. "Vector Prime, Marissa Fairborne, it is good to see you again, but who is this? "This is a Time Lord known as the Doctor," Vector Prime said. "How do you do?" the Doctor said. "Your friend happened to come across me and informed me of your situation." "He wasn't easy to find," Marissa said, but her parents had been members of the Joe team. They gave her the skills needed to excel at anything she did. "What is our situation, Vector Prime?" Optimus asked. The renegade Decepticon, Bug Bite completed his experiment to merge realities. The Alternity tried to stop him, but they were too late." "Yes," Vector Prime said. "Doctor, what can we expect?" "It's not good. It's very not good. In the short term, you will find displaced people appearing unexpectedly. Beings from the Past, the Future, or alternate realities. 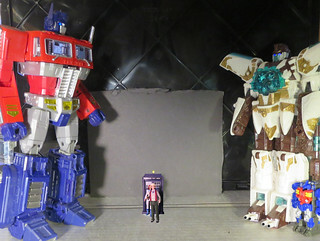 For now, this will be focused on Cybertron, but soon, the effect will spread out into the wider universe." "And the long term?" Optimus asked. "The long term," the Doctor said, "will result in so many realities trying to coexsist within this one, that it will collapse into a black hole, that will swallow all other realities." "I am here," Vector Prime said, "because I watch over all of time... and Time is running out... and that isn't possible." "I'll do what I can," the Doctor said. "I can slow the process, but I can't stop it." "We will find a way to restore our reality," Optimus Prime declared. "I don't know how, but we will find a way."